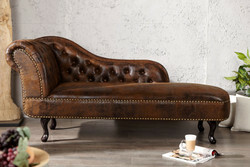 Casa Padrino offers you numerous Chesterfield Chaiselongues in different colors. 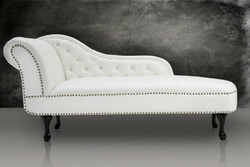 The term chaise longue originally comes from the French and means something like "long chair". 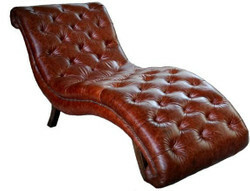 The chaise longue is since the second half of the 19th century, the name for a low, padded combined seating and reclining furniture for one person. It is very reminiscent of the ancient Triclinium. Characteristics of this rest or day bed, which serves the short afternoon nap, occasionally as a guest bed, are a raised headboard and a uniform cover, which covers apart from the supports, all construction parts. 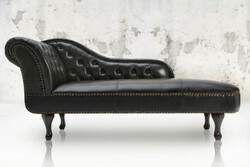 All Chesterfield chaise longues are made of very high quality materials. For this reason, we guarantee that you will enjoy these pieces of furniture for a long time. Whether you are setting up these stylish and exquisite modern chaise longues in your business premises or at home, you will always be able to enjoy a noble and splendid appearance with these pieces of furniture and inspire your guests. Idealism and passion are very important at Casa Padrino. If you have questions or special requests regarding our offers, please call us on the hotline + 49-201-36577485 and our qualified support will help you in every detail! Guaranteed! Casa Padrino, your baroque wholesale on the internet and on site.